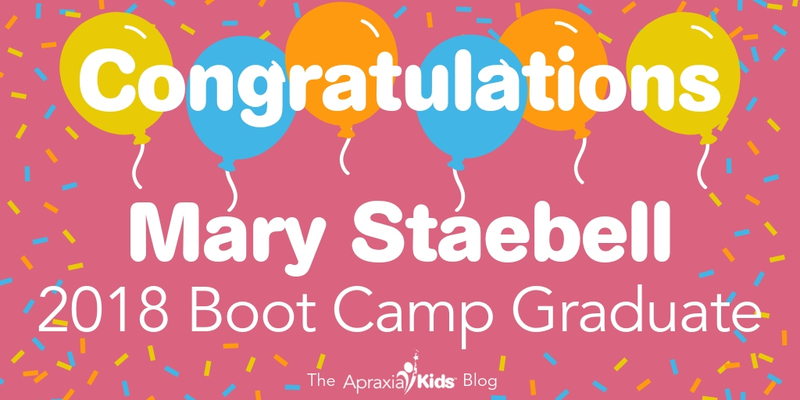 Congratulations to Mary Staebell, M.A., CCC-SLP, for graduating from the Apraxia Kids Intensive Training Institute (Apraxia Boot Camp)! A graduate of the Communicative Disorders and Sciences Department at the University at Buffalo, Mary earned a Master’s degree in Speech-Language Pathology (SLP) and began practicing in the Western New York region in 2007. She holds a license to practice as a speech-language pathologist in New York, as well as a New York state teaching certificate in the area of Speech and Language Disabilities. Mary is a member of the American Speech-Language-Hearing Association and maintains her Certificate of Clinical Competence (CCC-SLP). Her practice focus has been with the pediatric population, with a concentration on toddlers and preschool age children. Mary’s interest in childhood apraxia of speech was piqued soon after she began practicing and has continued ever since. Since 2016 she has been employed at the University at Buffalo (UB) as a practicing SLP and clinical supervisor at the UB Speech-Language and Hearing Clinic. At the university clinic, Mary continues to develop her specialty in the diagnosis and treatment of pediatric speech sound production disorders, including childhood apraxia of speech. Mary: A deeper understanding of apraxia of speech as a disorder of movement; a critical foundation that guides appropriate diagnosis and treatment. Mary: The community of SLPs who support each other through the apraxia boot camp group is a wonderful resource. I know I am but a click away from a fellow boot camper! Mary: I spoke in early March to a group of SLPs in the area (mostly school-based) about diagnosis and treatment of CAS, and encouraged them to contact me and pass along my information to those families who I might be able to assist. This fall I will be providing a lecture in the graduate motor speech disorders class at UB on CAS. Mary: Go for it! The experience was exhilarating, challenging, and worth every minute and every penny.